You are not going to believe this, but when I was testing John's url from my last posting to make sure that it worked....of course I had to read it. This new button was popping off the page and you know what it was??? You will never guess. Can you believe it? I love it. A KAL just for me. Since I already started. 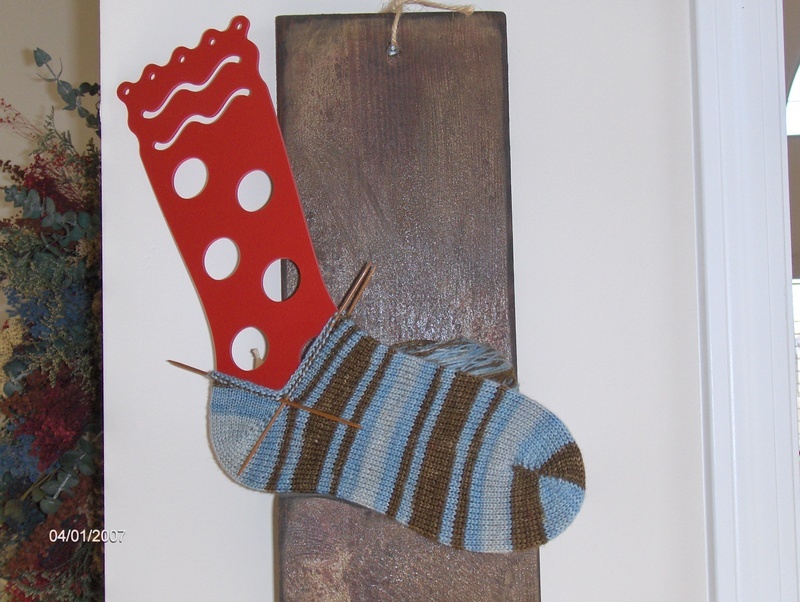 Okay....now, this is what all you sock knitters need to do now is join the KAL and purchase the pattern. Or I guess you could purchase the pattern and then join the KAL. Either way would work for me.To join the KAL just click on the button and we've already discussed where to buy the pattern in my other post. My Day of Silence for the Victims of Virginia Tech! This is my day of silence for the victims of Virginia Tech. I have so much grief running around my heart and head right now that only silence will come out of my mouth. Poetry in Pink: Pink Elephant Sock? I was going to take a picture of Jake posing for y'all. I was also going to take a couple pictures of the socks I'm knitting and my Tulip Bud dishcloth for my KAL (I'll be more precise tomorrow). Howeeever, when I picked it up to to take my first picture, it wouldn't turn on....dead battery. It seems strange that my battery icon still is showing life on it the last time I uploaded and now it's dead. Well, nothing I can do except put the charger on it. Wow, did we have a busy weekend. I didn't have a chance to post at all. We have decided to build a new condo or some people call them duplexes. Saturday we had to pick out all our interior colors, cabinets, flooring, etc. We were there forever. You know when you decide to build or buy a new home what that means. :~( We have to put this one up for sell. We have to meet with the agent either Tueday or Wednesday and get this started. The problem being is it will be 4 months or more before our new home will be ready. I just worry about the unknown. Will we have to move twice? I don't like to loose control. Oh and then the showing of the house. yuk! Well, for something fun, I found this poem searching for pink poetry. I think it's a hoot. I look at it as I knitted a size 17 sock in pink while I slept. Have a great one and Knit on! I took this quiz from Tiennie Knits. You're Marianne Dashwood from Sense and Sensibilty by Jane Austen! I am Marianne Dashwood from Sense and Sensibilty by Jane Austen! This surprises me abit but then when I remember myself as a very young naive girl...maybe. I also copied her list of 100 books. Before knitting took my life over I had a book stuck in my face 24/7. I have not opened one book (other than knitting books) since I've picked up the needles and the blogging. I read about others who continue to read and I have actually made promises to myself...tomorrow I will start this book. 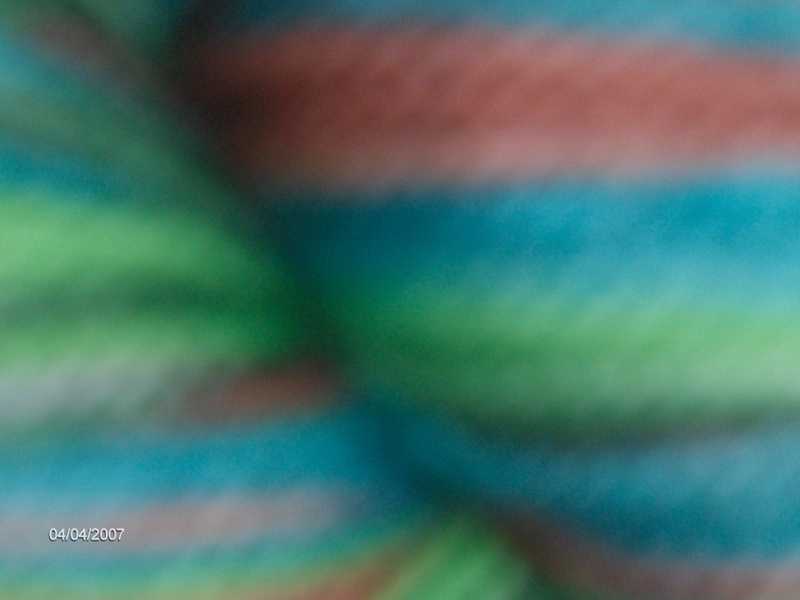 Tomorrow comes and I have to knit and blog. I don't have enough time. In the list of books below, bold the ones I've read, italic the ones I want to read, cross out the ones I won’t touch with a ten-foot pole, a cross (+) in front of the ones on or were on my book shelf, and asterisk (*) the ones I've never heard of. I have been knitting...A little! I wanted to show you one of the socks that I have been knitting during my move. 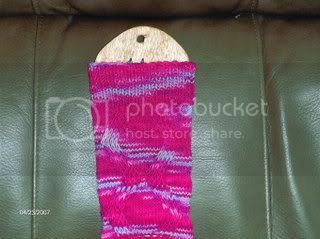 This sock is knitted in Sknitches Synopation Self-Striping Sock Yarn in the color Colleigiate. 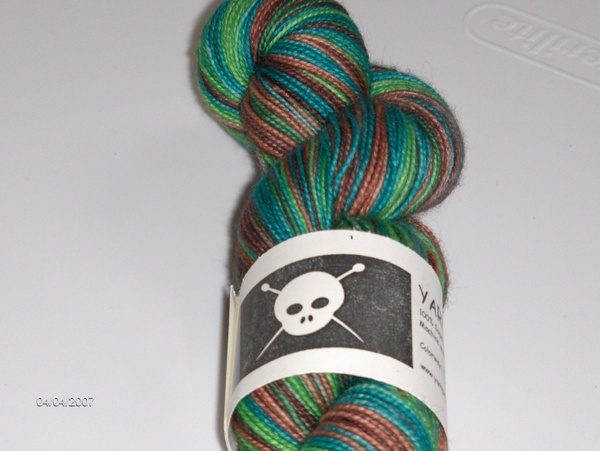 I purchased the yarn from Sheri at The Loopy Ewe. I really like how the blues and browns strip together. The pattern I'm using is Wendy"s Generic Toe-up Sock by Wendy. You can click on the picture and see it closer. Oh and I forgot to take a picture of my Duet sock I'm knitting on one circular needle. I'm really starting to like the flow of knitting on one needle. I'll get a picture of those socks tomorrow. They are toe up and I'm almost ready for the after-thought heel. I thought I'd throw in a picture of Jake. He's on one of his kitty perches by the window. He rules his little world from there. 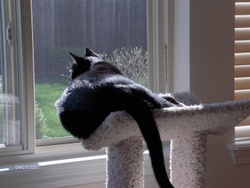 He can see his squirrels, birds and he even has three other cats that live near by. So I'm going back to my knitting. I wish you all a great Sunday.